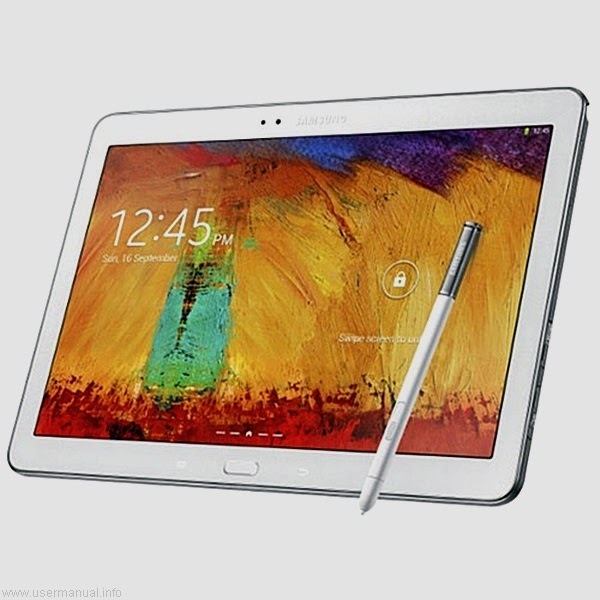 Samsung Galaxy Note Pro 12.2 SM-P900 user guide manual – Samsung Galaxy Note Pro 12.2 available since February 2014 with larger screen to support multitasking work on documents and almost enough to fit with A4 page. Samsung Galaxy Note Pro SM-P900 featuring office app tools and wireless capabiluty printing and collaboration tools. Samsung SM-P900 come with wide bezel screen for comfortable grip with vivid screen and great views for angles. Samsung Galaxy Note Pro 12.2 SM-P900 equipped with specifications and key features such as: 295.6 x 203.9 x 8 mm (11.64 x 8.03 x 0.31 inches) in dimension with 750 g (1.65 lb) in weight plus S Pen, 12.2 inches Super clear LCD capacitive touchscreen 16 million colors with multitouch up to 10 fingers and Samsung TouchWiz UI, microSD up to 64 GB, 32 GB internal storage, 3 GB of RAM, 8 megapixel rear facing camera with autofocus and LED flash, 2 megapixel front facing camera, run Android 4.4 Kitkat operating system, powered by 1.9 GHz quad core and 1.2 GHz quadcore Exynos 5 Octa 5420processor, Li-Ion 9500 mAH battery polymer with up to 131 hours music time, up to 11 hours video play and up to 13 hours internet use. Samsung Galaxy Note Pro 12.2 SM-P900 pdf manual available to download in pdf file format with 10.42 MB size and contains of 99 pages. Samsung Galaxy Note Pro 12.2 SM-P900 user guide manual will help users, owners and buyers with important information you need about the smartphone including key features, add functions, settings and some solution for troubleshooting.